After months of hiding from the media, Kylie Jenner finally confirmed the pregnancy we’ve all been speculating about for the last few months. She also announced that she had given birth to a baby, a girl, on February 1st, 2018. The announcement came with an almost 11-minute YouTube video that chronicled Jenner’s life while pregnant, filled with beautiful photos, videos, and plenty of sweet moments. Another sweet moment? 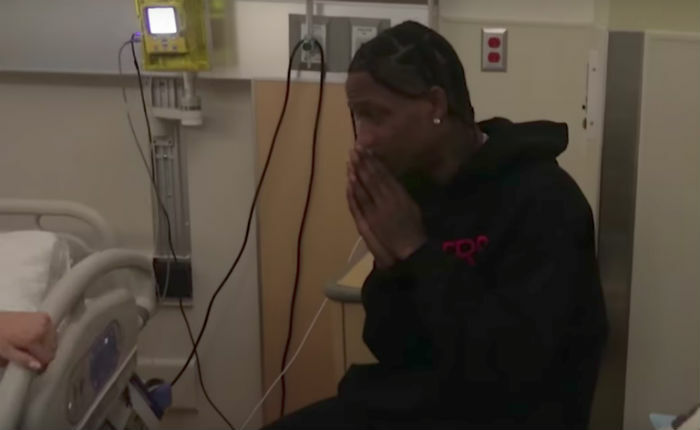 Travis Scott’s response to Jenner’s baby announcement, which is so cute it’s kind of making us cry. Scott is, of course, the father of Jenner’s baby. The two were first spotted together in April 2017 at Coachella, and made their relationship official at the Met Gala in May. In September 2017, rumors started swirling that the couple was expecting their first child together, but both kept silent on the matter. Jenner pretty much disappeared from social media, aside from some ads for her cosmetics line and re-promos of old Instagram pics, and Scott managed to avoid answering any questions about the supposed pregnancy. So it’s no wonder that people have been curious about how he feels about the baby. 4 ever!! It’s too adorable. Even cuter, though, is watching Scott and Jenner’s relationship in the video Jenner posted to YouTube. The video is titled “To Our Daughter,” and it shows intimate moments between the two throughout the pregnancy. One of the cutest shots is when Jenner and Scott are seeing their baby during a sonogram — Scott is visibly excited, and you can’t help but feel happy for both of them. Scott also gave Kylie the perfect baby gift. At one point during the video, we see Jenner opening a box of tiny Nike Air Jordan high-top sneakers from Scott. Jenner says, “These are so cute. Didn’t you say they were the first ones ever made?” Relationship goals! We can’t wait to see these two parent together — there’s bound to be many Instagram photos and Snapchat videos to document their new baby girl.